I have to admit, my last message about Tomatina was written through some rose coloured glasses. It was overcrowded and full of tourists. Yes it was fun, but it was hardly a Spanish experience. As I mentioned last time, for this week in Spain I've been with a fairly large group. One of the guys travelling with us is a local, and mentioned that the village he is from has an annual festival a couple of days after Tomatina. As it was fairly close to Valencia, it made sense to a detour on the Spanish tour to have a bit of local experience. It's really hard to describe the festival with words, but just bear with me. It started the day before. Iban, our local, informed us that the night before there's a big party in the streets around town. We wouldn't have to stay up really late, you know, just till 6 or 7am. The next day was meant to start at midday with dancing in the park. Since bedtime ended up being around 8ish, we decided to scratch that and get up at 2pm for out lunch reservation. Unfortunately it turned out the next day is the only day of the year that locals don't take a siesta and we were unceremoniously woken around 12:30 to loud cannons going off outside our room. They were shooting lollies in the air, or something, kids were running round grabbing stuff so I'd say lollies. After a lunch of rabbit, served like cat food, but so good I pretty much inhaled it (unlike me I know), we headed to Iban's parents for desert and drinks. We got back around 6:30, maybe time for a nap? No, the festival starts at 7! SO we put on our flame retardant outfits and head outside to the main square, now lined with massive giants, built by the locals from town and surrounding villages. A little later the parade of the giants begins as someone gets inside each giant and is led around the streets by small groups of marching type bands. We joined in the parade between a band and couple of giants, dancing, jumping, waving and feeling a little inconspicuous when we would pass a crowd of locals watching, but they didn't seem to care and waved at us, so I guess it was all OK.
We got back into the main square as duck was setting in and waited. The time for running with the devils was getting close. At first we thought our protective clothing was a little over the top, but then we were starting to notice locals more covered up than us, some had sprayed themselves in water and we're starting to think this might get a little nuts. Iban filled us in, try to stay close to a devil , then the fire won't get you, some people try to stand up to the devils, don't do that unless you want to be sprayed with sparks.... Hmmmm...... was this a good idea? 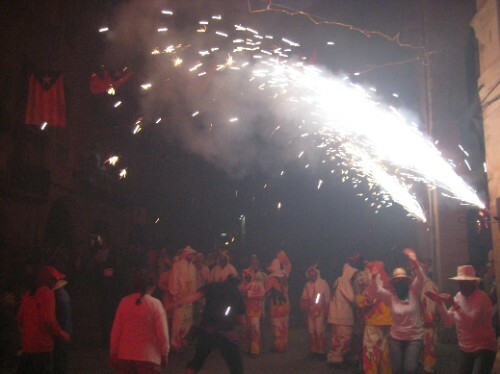 But then it started, fireworks were let off, the walls of the town started spraying sparks. A string or fireworks had been strung up above the main square and they went off in a cascade of spark. The lights had been turned out so it was pitch black but for the sparks, it was one of the most amazing visuals as the crowd ran under the sparks and started jumping and dancing around, with everyone just lit up by the light from the sparks. I can't describe it but will look for photos. As this went on the devils would be slowly directing the crowd around a similar loop to the walk of the giants. Occasionally the crowd would 'stand up' to the devils and sit on the ground chanting something at the devils and copping a face or back dousing with sparks before running away. I joined in on a fair few of those, my straw hat and T-Shirt now proudly displaying singed battle scars. Half way through the fireman had kindly set up their truck and were spraying the crowd. Drenched and protected we set off again, taunting and jeering at the devils in our new liquid armour. We ended up back in the main square and the devils went nuts with the fireworks. Massive displays where they stood on each others shoulders and let off hundreds of Catherine Wheels at one. Then a big drum band started everyone got in a circle and started dancing around for another half hour or so. It was about 11 when it finished. I could have happily gone to bed after that, I didn't think anything could top that, but there was a concert in the park so we headed over to that, cause you're meant to stay out all night (or so we were told). The concert was actually really good. The first a fairly soft rock band, like Maroon 5, not my thing but decent enough to listen to for a couple of hours. After that a ska band came on and the crowd went off. I got to experience a Catalan mosh pit, which is way more fun than an Aussie mosh which is all about being borderline crushed and jumping around for an hour. Everyone does this funny little running on the spot type dance and bumps and bounces off each other like balls and bumpers in a massive pinball machine - biggest multiball ever! Then after the band was over, there was still a couple of hours left until daylight, but thankfully everyone decided it was bedtime so we headed off. Then I lay in bed wired until daylight anyway, unable to sleep - I actually wrote most of this blog then. The nest part about the couple of days was the absolute acceptance we received from the locals. Everyone tried to speak English to us (more so than the rest of Spain combined), during the devil run people were running with us and pulling us into the defence against the devils, then coming up and talking with us afterwards. Considering you're always kept at arms length in 'Tourist Towns', this was so refreshing. In these days of EasyJet and other low cost carriers, it seems impossible to find a corner of the world untouched by tourists. I guess it doesn't help that I pretty much live by my Lonely Planet while travelling, but it starts to get sort of annoying going to places that everyone has seen before, taking photos of the same statue you've seen on television. I honestly can't describe how lucky I feel to have visited this place. You may have noticed I didn't mention where this took place. This is on the off chance that Lonely Planet of some random travel website read this and turns it into the next Tomatina. It's just so nice to know that this sort thing still exists and I was lucky enough to be pulled into it. 5 star day. Best yet.